"When it comes to perversity, no one can match Ataru." Even though I've seen it a half billion times already, I can't help but get a kick out of the opening credits for this series. It's not like there's anything overtly humorous about it, but Lum shaking her finger and doing her little dance never fails to bring a smile to my face. It is this kind of simple appeal that makes Urusei Yatsura so enjoyable. Whether it is Ataru Moroboshi's relentless attempts at womanizing, his "wife," the flying Oni, Lum, electrifying him for his indiscretions, or his mother's constant reaffirmation that she should never have had him, the qualities present in this show are just plain funny. Despite the number of episodes I've seen so far, UY manages to come up with something fresh with each outing, while still keeping the familiar traits of its characters intact. Disc 7 presents another four episodes, and once again Ataru finds himself in a whole mess of trouble. Things start off on a class outing, with Ataru relishing in his apparent freedom from the attentive eyes of Lum, who routinely spoils his lustful advances towards other women. Out in the wilderness, Ataru tries to woo Shinobu into a romantic interlude, but she knows Ataru too well, and doesn't fall for the ploy. She does however spot a dried lizard in a tree, and sends Ataru to retrieve it for her, then uses the animal as an excuse not to return his amorous advances. While his classmates spy on a shapely figure bathing in the hot springs, Ataru persists in gaining some ground with Shinobu, but winds up falling into the hot springs, and reconstituting the kappa in his pocket—who turns out to be a long lost king. As a reward, this frog creature invites Ataru to his underwater palace, where all manner of pleasures await, but his disappearance has the rest of his classmates fearing he has drowned. The second installment is a classic. After buying some magic earmuffs, Ataru and Ten have their bodies switched. Ataru is quick to realize that he can get up to plenty of lechery in the cute Ten's body, and sets off to be cuddled by as many women as he can. Ten wants out of Ataru's body as quickly as possible, not used to being earthbound, and afraid of what this pervert human will do to his innocent reputation. While chasing after his body, Ten runs into a lamp post and is knocked silly, which doesn't help his case while trying to explain to Lum what has happened. If that wasn't crazy enough, Sakura shows up and puts on a pair of the earmuffs, and now Ataru is in her body! Mendou is on the warpath after Ataru adopts a caterpillar with a voracious appetite. With his new pet Imo in tow, Ataru and Lum are on the run from a gang of maddened classmates, after the grub chows down on everyone's bento lunches. Finally, Ten enlists the help of Kintaro to expose his crush on Sakura. This riles Ataru to no end, as the midget alien lands a date with the gorgeous priestess. Like most of the other episodes, all of these are pretty much self-contained, making it easy to just dive in and watch as many as you have time for without getting confused by ongoing storylines. There are occasional references to past episodes, so watching them in order is good, but isn't mandatory other than for recognizing new characters. A new eye catch is revealed in Go Imo, which isn't as good as the originals. While some may find the animation too dated, there is a definite charm to Urusei Yatsura, and its effective humor doesn't date in the least. Image Transfer Review: For a show dating from 1982, I don't know how realistic it is to expect a flawless transfer, and that certainly isn't what we get here. Fortunately, the opening and end credits seem to suffer the most, and while the episodes do have their own issues, they aren't as glaring. The credits have an abundance of chroma noise (especially deep blues and reds) and color bleeding, with dot crawl and mosquito noise on the red title logo. Most annoying is the excessive ghosting, which causes streaks in the image. There is some print damage during the show, but it is isolated. Colors are fairly vibrant, though sometimes look a bit off. The ghosting is present, but less noticeable. Outlines look a little sketchy at times, and there is some ringing. While there are some compression artifacts here and there, most of the problems seem to originate in the masters. If you can ignore the intro and extros, this doesn't look that bad. Audio Transfer Review: Mono Japanese audio does its job, but isn't really that outstanding from a sonic perspective. From a technical standpoint there is nothing unexpected here, hiss wasn't really an issue this time out. A good presentation of the source material. Extras Review: Scene selections for each episode are available from the main menu, and are the extent of on disc extras. A bio for Benten is on the back cover, and liner notes are limited to a single- and double-sided card this time out. As usual, the notes have a lot of useful information, and point out things that wouldn't be readily apparent to the casual viewer. 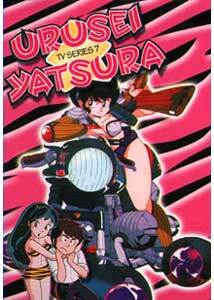 Urusei Yatsura still entertains as one of my favorite anime series. The situations are wacky, the characters priceless, and the mischief non-stop. In a perfect world this would get a much needed restoration, but the presentation here allows for the enjoyment of the content with only a relatively small tradeoff in image quality.